Murder by Gaslight: Fatal Cutting Affray. Reveley ate his sausages rather quickly prompting Mike Green, a 60-year-old waiter, popular and good-natured, to jokingly ask, “Did you eat all that by yourself?” Reveley replied rather savagely that it was none of Green’s ---- ---- business. Green, astonished by the force of his remark, turned away and waited on another customer. Reveley made a few more harsh remarks then left the Golden Lion and went across the street to Schweikhardt’s saloon. Still fuming, Reveley returned to the Golden Lion a half an hour later to continue his fight with Mike Green. Green at first tried to calm Reveley down but made it clear he would not stand for any trouble and by some accounts, Green threw the first punch. Then everything happened quickly. Mike Green screamed in pain the patrons of the saloon looked up and saw that Reveley had plunged a knife into Green’s chest. Peter Noel, the bartender, grabbed a club he kept behind the bar and landed a blow on Reveley’s hand, saying “Drop that knife or I’ll knock your head off.” Reveley threw down the knife and made a break for the door; he ran across the street and hid in Schweikhardt’s. Officer Kavanaugh arrived on the scene a few minutes later and convinced Reveley to surrender. Mike Green was unconscious when he was taken to the City Hospital. According to Peter Noel, there was more to the disagreement than Mike Green’s joking remark. He said that the quarrel originated over a bill for drinks that Green accused Reveley of owing him. In police custody, Reveley denied owing money to Green or anyone at the Golden Lion. Reveley was released on bail, but when Mike Green died nine days later, he was arrested again and charged with second-degree murder. While Thomas Reveley was in jail awaiting trial, his family problems continued. His brother Ep. Was arrested for assaulting Charles A. Fuchs, the plaintiff’s attorney in his father’s lawsuit, inflicting a four-inch wound in his head. The murder charge against Thomas Reveley went to trial on May 3, 1896, and lasted just three days. Reveley and nearly all who followed the trial were confident that he would be acquitted for justifiable homicide but after deliberating all night, the jury returned a verdict of guilty. Thomas Reveley was sentenced to 10 years in the penitentiary. “Attorney Reveley Locked Up,” St. Louis Post-Dispatch, February 18, 1896. “Fatal Cutting Affray at the Golden Lion.,” St. Louis Republic, February 9, 1896. 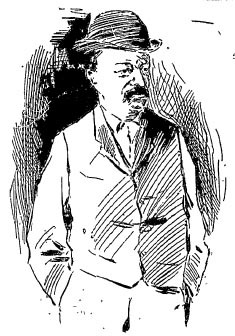 “Lawyer Reveley Held,” St. Louis Post-Dispatch, February 19, 1896. “Reveley on Trial,” St. Louis Post-Dispatch, May 3, 1897. “Reveleys Are Cutters,” St. Louis Post-Dispatch, April 24, 1896. “Stabbed at a Lunch Cunter,” St. Louis Post-Dispatch, February 9, 1896. “Ten Years for Killing a Waiter,” St. Louis Post-Dispatch, May 6, 1897. Justifiable homicide? I highly doubt that unless Green made death threats and pulled his own weapon.